11 A None No Power Seat 11 A is a standard Economy Class seat that has extra legroom due to the Exit Row however, may also have limited to no recline. There is no floor storage for this seat during takeoff and landing. 11 B None No Power Seat 11 B is a standard Economy Class seat that has extra legroom due to the Exit Row however, may also have limited to no recline. There is no floor storage for this seat during takeoff and landing. 11 C None No Power Seat 11 C is a standard Economy Class seat that has extra legroom due to the Exit Row however, may also have limited to no recline. There is no floor storage for this seat during takeoff and landing. 11 D None No Power Seat 11 D is a standard Economy Class seat that has extra legroom due to the Exit Row however, may also have limited to no recline. There is no floor storage for this seat during takeoff and landing. 11 E None No Power Seat 11 E is a standard Economy Class seat that has extra legroom due to the Exit Row however, may also have limited to no recline. There is no floor storage for this seat during takeoff and landing. 11 F None No Power Seat 11 F is a standard Economy Class seat that has extra legroom due to the Exit Row however, may also have limited to no recline. There is no floor storage for this seat during takeoff and landing. 12 A None No Power Seat 12 A is a standard Economy Class seat that has extra legroom due to the Exit Row however, there is no floor storage for this seat during takeoff and landing. 12 B None No Power Seat 12 B is a standard Economy Class seat that has extra legroom due to the Exit Row however, there is no floor storage for this seat during takeoff and landing. 12 C None No Power Seat 12 C is a standard Economy Class seat that has extra legroom due to the Exit Row however, there is no floor storage for this seat during takeoff and landing. 12 D None No Power Seat 12 D is a standard Economy Class seat that has extra legroom due to the Exit Row however, there is no floor storage for this seat during takeoff and landing. 12 E None No Power Seat 12 E is a standard Economy Class seat that has extra legroom due to the Exit Row however, there is no floor storage for this seat during takeoff and landing. 12 F None No Power Seat 12 F is a standard Economy Class seat that has extra legroom due to the Exit Row however, there is no floor storage for this seat during takeoff and landing. 27 C None No Power Seat 27 C is a standard Economy Class seat whose proximity to the lavatory and galley may be bothersome. 27 D None No Power Seat 27 D is a standard Economy Class seat whose proximity to the lavatory and galley may be bothersome. 28 A None No Power Seat 28 A is a standard Economy Class seat in the last row of this plane with limited recline. The proximity to the lavatories and galley may be bothersome. 28 B None No Power Seat 28 B is a standard Economy Class seat in the last row of this plane with limited recline. The proximity to the lavatories and galley may be bothersome. 28 C None No Power Seat 28 C is a standard Economy Class seat in the last row of this plane with limited recline. The proximity to the lavatories and galley may be bothersome. 28 D None No Power Seat 28 D is a standard Economy Class seat in the last row of this plane with limited recline. The proximity to the lavatories and galley may be bothersome. 28 E None No Power Seat 28 E is a standard Economy Class seat in the last row of this plane with limited recline. The proximity to the lavatories and galley may be bothersome. 28 F None No Power Seat 28 F is a standard Economy Class seat in the last row of this plane with limited recline. The proximity to the lavatories and galley may be bothersome. 3 A None No Power Seat 3 A is a standard Economy Class seat that may have restricted legroom due to the position of the bulkhead. 3 B None No Power Seat 3 B is a standard Economy Class seat that may have restricted legroom due to the position of the bulkhead. 3 C None No Power Seat 3 C is a standard Economy Class seat that may have restricted legroom due to the position of the bulkhead. 3 D None No Power Seat 3 D is a standard Economy Class seat that may have restricted legroom due to the position of the bulkhead. 3 E None No Power Seat 3 E is a standard Economy Class seat that may have restricted legroom due to the position of the bulkhead. 3 F None No Power Seat 3 F is a standard Economy Class seat that may have restricted legroom due to the position of the bulkhead. 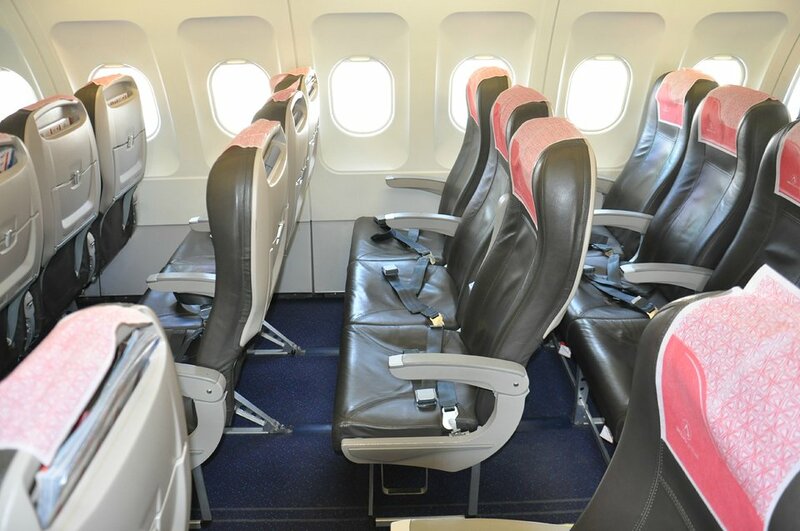 AtlasGlobal flies their Airbus A320 in a two class configuration with 8 Business Class recliner seats and 150 standard Economy seats. AtlasGlobal flies 1 versions of Airbus A320.